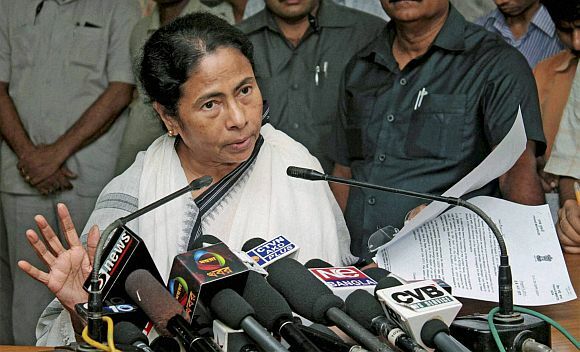 Rediff.com » News » Is the Trinamool Congress warming up to the BJP? Is Trinamool Congress leader and West Bengal Chief Minister Mamata Banerjee warming up to the Bharatiya Janata Party? Straws in the capital's political winds appear to suggest that the TMC and the BJP, which were partners in the National Democratic Alliance regime, are again coming close to each other. Leaders of the two parties are in constant touch these days. More recently, TMC's Rajya Sabha MP K D Singh called on BJP President Rajnath Singh, a move which is being regarded as a significant political development as the Trinamool member is known for his proximity to Banerjee. The meeting is learnt to have been facilitated by newly-appointed BJP general secretary Rajiv Pratap Rudy, who has a hotline to Rajnath Singh. The upshot of this meeting has been that the BJP has studiously avoided any comment on the Saradha chit fund scam which has rattled the Mamata government. The saffron party has especially refused to say anything on the relationship between the TMC and the Saradha group owner Sudipto Sen. When questioned persistently about the TMC's involvement in Sen's business group which had deprived lakhs of small investors of their savings, BJP spokesperson Prakash Javedkar only said, "The truth should come out and the guilty must be punished. We want an impartial inquiry and want the government to compensate the investors." 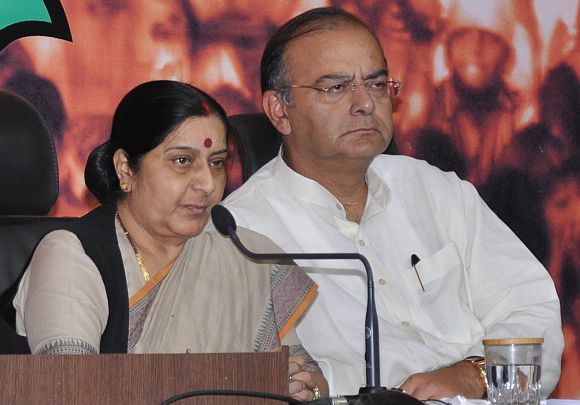 The BJP has adopted a conciliatory stand towards the TMC chief for obvious reasons. Hopeful of ousting the beleaguered Congress-led United Progressive Alliance government in the 2014 Lok Sabha elections, the BJP is seriously scouting around for additional partners and Banerjee is definitely on top of its priority list, especially since the two parties have worked together in the past. Gujarat Chief Minister Narendra Modi was also partial towards Banerjee during his recent visit to Kolkata when he had publicly blamed the previous Left Front government for all the ills afflicting West Bengal today. More immediately, the BJP wants to shore up the opposition's numbers in the 30-member Joint Parliamentary Committee, probing the 2G spectrum allocation, as it gets set for a showdown with the ruling coalition. If the BJP soft-pedalled the chit fund scam, the TMC reciprocated the gesture by joining other opposition parties in its protest against Congress leader P C Chacko, who heads the 2G JPC. The Trinamool, along with other opposition parties like the BJP, Left parties, Biju Janata Dal, the DMK and the AIADMK, submitted a memorandum to Lok Sabha Speaker Meira Kumar last week to demand Chacko's removal as JPC chairman. While blaming him for leaking the contents of the draft copy of the JPC report giving a clean chit to Prime Minister Manmohan Singh and Finance Minister P Chidambaram, the petition raised strong objections to Chacko's "highly partisan, unfair and prejudicial conduct." According to the letter, Chacko failed in his duty to lead the JPC to bring out the truth and instead "used the JPC to conceal and subvert the truth." The Trinamool's stand is being attributed to the meeting between K D Singh and Rajnath Singh. It is at this interaction that the BJP president persuaded the TMC to pitch in with the other opposition parties although the Trinamool had initially gone along with the Congress. 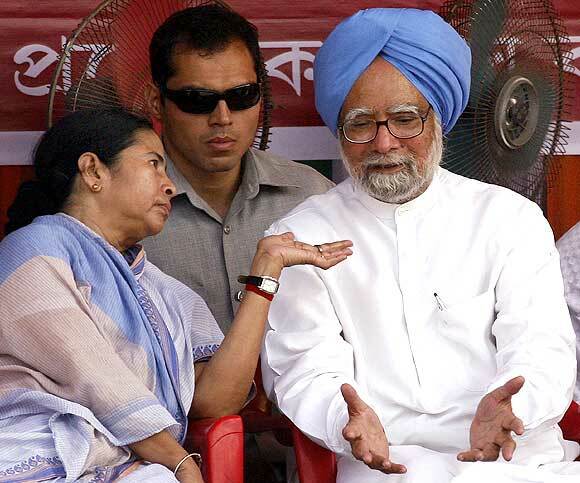 TMC's senior leader Saugata Roy had gone on record to state that it did not agree with the opposition position that Prime Minister Manmohan Singh should be asked to appear before the JPC. However, this line was subsequently reversed. Trinamool's support has given the opposition an edge in the JPC as it can now count on 15 of its 30 members. The Congress's hopes now rest on Mulayam Singh Yadav's Samajwadi Party and the Mayawati-led Bahujan Samaj Party, which have three members each on the panel. The SP has been blowing hot and cold on this issue. Its spokespersons had recently stated that DMK leader A Raja, who is sought to be blamed for the 2G spectrum scam, should be heard by the JPC failing which its report could not considered fair and impartial. While the BJP has succeeded in roping in the Trinamool on the 2G issue, it is now to be seen if this cooperation can led to a more durable relationship. The BJP would be more than happy to welcome Mamata into its fold, the Trinamool should have serious reservations about entering into a pre-poll alliance with the saffron party as she cannot risk alienating her minority support base in West Bengal by aligning with the BJP. However, it is entirely possible that the Trinamool would not hesitate to support the NDA if it is able to muster the numbers to form the government after the next general elections.